Here is a hadeeth that lists the names of the Prophets (عليهم السلام) and their successors (عليهم السلام). This hadeeth is da`eef (weak) per isnaad not only because there is a majhool narrator (Muqaatil bin Sulaymaan), but because the Hadeeth is mursal (disconnected), the rest of the narrators in the chain are thiqaat (pl. thiqah). NOTE: I have attempted to transliterate the names of Prophets (عليهم السلام) as best as I can, as these names do not have the harakas, so the spelling is not official. “I am the master of the prophets; my successors is the master of successors; and his successors are the masters of the successors. That Adam asked Allaah (عَزَّ وَ جَلَّ) to make for him a righteous successor so Allaah (عَزَّ وَ جَلَّ) revealed to him, “I honored the prophets with prophethood, and I chose the best of my creations as their successors. O Adam! Make Sheeth your successor. So he appointed Sheeth as his successor. And Sheeth was a gift from Allaah (عَزَّ وَ جَلَّ), and Sheeth appointed his son Shabbaan as his successor. He (Shabbaan) is from the descent of a Hooree that Allaah (عَزَّ وَ جَلَّ) sent to Adam from Jannah (heaven) and he married her to his son, Sheeth. 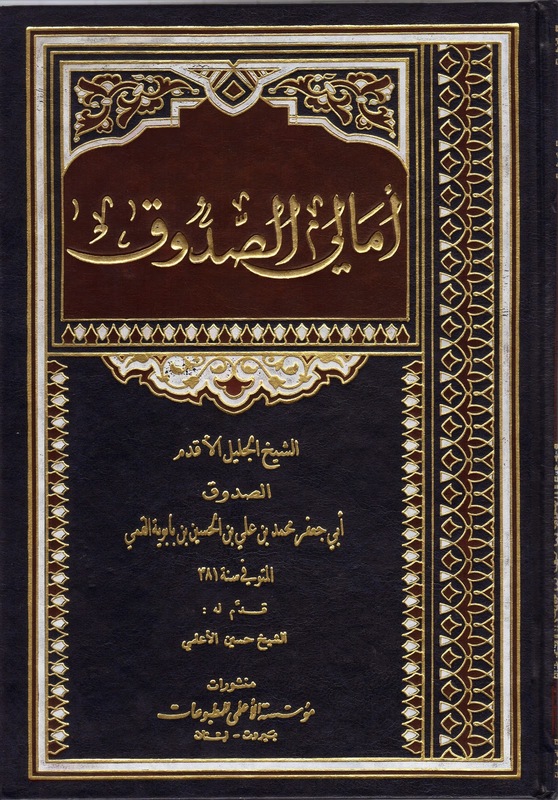 In Al-Sadooq’s book Kamaal Al-Deen, this hadeeth goes through a different isnaad at the beginning, through many more narrators all of whom are thiqaat. C'mon guys, Yahya ibn Zakariyyah coming after Shamoun the Successor of 'Eesa (AS). This contradicts well known dirayah, therefore I prefer the Dirayah over the Riwayah and reject it. Secondly Muqatil ibn Sulayman is known for Isra'iliyyat so we reject him even if Sadooq didn't. The content doesn't make any sense & anachronistic. For example, just consider the years between Yusha' bin Nun (Yehoshua' ben Nun) & Musa & also Ashif to Zakariyya. Moreover, Yahya bin Zakariyya was already murdered even before Isa was taken up, right? I think you guys haven't read the tradition fully, and if you did, then you should know the beliefs of the Sunnis and the Jews and Christians. This cannot be an Israa`iliyyah or Sunni tradition for many reasons. 1.) This is a hadeeth contains a unique shee`ah beliefs that isn't found in the Sunnis and Christians faith, which is of Allaah (SWT) sending the "Hooree" for Adam's son for them to procreate. Both Sunnis and Jews&Christians beliefs the brothers and sister procreated amongst themselves. So just by that alone you can tell this is a unique shee`ah hadeeth not taken from either sect. 2.) Also, some of the successorships of these Prophets are unique to the Shee`ah faith, that neither Sunni nor the Jews& Christians have. It cannot be sunni because if you look at the end of the hadeeth it clearly states the wilaayah of the Imaams after Ahl Al-Bayt (AS). 3.) Muqaatil bin Sulaymaan is not an `Aamee (Sunni) according to our books, instead he is a Zaydi of the Batriyyah sect. (See: Rijaal Al-Toosi, pg. 146; Al-Kashee's Rijaal, pg. 390; Al-Khoei's Mu`jam, vol. 18, pg. 311, person # 12603). 4.) Also, if you look at the aHaadeeth of Muqaatil, majority of them are pro-Ahl Al-Bayt. So rejecting this hadeeth because it isn't "logical" or "it doesn't make sense" is a bold move. Unless you can find a khabar that contradictions this Hadeeth with more SaHeeH isnaad then rejecting this hadeeth is out of the question, especially since our classical scholars have accepted this hadeeth. I did not know where to put it. But I have a request, actually two. 1. Can you make a post about Istikhara, its method, when should it be done etc. 2. And also duas for increase in sustenance. 1- one aspect of the hadith may not be taken from opposing sects and religions, fine. However that is not relevant, the successorship is again probably the whims of Muqatil mixed with that which he remembered from Jews and Christians. He does this very often in his tafseer work. 2- Sure, however you assume that Jews and Christians were monolithic in this time and region and that Muqatil's memory didnt cause him to mix this all up. 3- Of course not, just an Anthropomorphising Batri Zaydi. Hardly the qualifications needed for this. 4- This is the logic of those who narrate the Fadhail reports of Sufis, hardly something you wish to join in. Logic is not the criteria here, the criteria is established history (Dirayah) namely did Yahya precede 'Eesa and we say yes definitely he did. Accepting this report would be akin to having a report stating that Asif ibn Barkiyyah was succeeded by Musa (AS). Which we would know is plain false. Lastly, I don't need to accept Muqaatil as reliable he was a batri. يكفي ولدى أسئله كثيرة ونرجو من جميع الروافض المشاركة فالمشرقي لا يعي ما يقول ويطلب مساعدتكم فأين الصدري والمياحي وجميع روافض العالم !!!!! Obviously the over heated retard above doesn't realise that we are conversing in english for a reason as its our conventional language. Brother Anonymous, please find me a khabar from Shee`ah books with a SaHeeH isnaad and opinion of scholars that contradict anything from this hadeeth, if not it'll be pure dhann (speculation). so this is now your method of adoption, you don't see the possibility that al-Saduq (AR) made a mistake in stating this riwayat was Sahih like he did with the 17,000 verses hadith in his book stipulating the Aqeedah of the Imamiyyah. How about YOU on the other hand give me a Khabar with a Saheeh isnaad stating this is the list of Awsiyah, note if you accept al-Saduq (AR) on this, I will hold you to accept the riwayats of Aban ibn Abi Ayyash, whom al-Saduq never came down harshly on either but rather extracted finer details of theology from. I have no idea why an intelligent brother such as yourself would EVER want to believe this Hadeeth, it's either the whims and desires of Muqaatil or the result of someone's memory lapsing. It's like if I found an authentic narration stating that the Earth was flat, I would not go around promoting it. Or a narration saying Musa (AS) was the successor of Asif ibn Barkhiyyah. I don't have an issue with this narration, so why would I want to find other saheeh khabar to list this. As I have said already, this is the most details account of the Prophets and their successors, HENCE why I narrated this hadeeth. So, now I should do the legwork for you and find you akhbaar that go in line with this? Since you seem as if you are "in tune" with our books as you make it seem, find me a khabar with a saheeh isnaad that goes against this. You are using bad qiyaas brother. Just because he accepts the 17,000 hadeeth, which the whole of the Taa'ifah did, doesn't mean he made a mistake about this. By that logic, you should reject the whole book `Itiqaadaat Al-Imaamiyyah since he made a mistake on there. I don't think you know about Al-Sadooq's books too much, he rarely if ever talks, and if he talks, it holds weight. So for him to get out of his way to say the khabar is SaheeH with a qawee isnaad means something. Bad Qiyaas again with Abaan, since he never said a hadeeth is saheeh with abaan in there. Mufeed rejects Abaan in his TaSaHeeH al-`Itiqaadaat in the last section of "fee aHaadeeth al-mukhtalif". Just because Al-Sadooq mentions Abaan in his book doesn't mean he takes from him. Abaan is a known liar throughout our Taa'ifah from the classical scholars to the contemporary. Once again bad Qiyaas with the earth being flat. First off, I am not bin Baaz, second it is a clear contradiction of the Qur'aan, third contradicts sciences, and we have no khabar like this alHamdulillaah. So once again, I request your to find me a khabar with a saheeh isnaad that lists the prophets and awSiyaa' that contradiction this. I am not going to do the legwork for you. Subhan Allah Brother, I recommend you do less speculation and instead confirm with me your speculations before airing them. I am very familiar with al-Saduq's works and own every one (extant and published) of them even the ones which are seen as dubious attributed to him. To quote from a narrator in your treatise on the doctrines of the Shi'a is a very good indication of accepting the Rawis. al-'Itiqadat is not like other works rather it is the doctrines al-Saduq (AR) found acceptable and the supporting proofs of such. Abaan secondly is not a known liar once more, in fact al-Tusi merely dismisses him as Dhaeef and Ibn al-Ghada'iri is the source for accusing Abaan of lying, and Ibn al-Ghada'iri is hardly known for being the most reliable source of the Imamiyyah. Alhamdulillah, I'm glad you take science into consideration. Do you accept the Science of Historicity and Historical Criticism? If so how could you accept that 'Eesa (AS) appointed a successor after his acension who was succeeded by Nabi Yahya (AS) when all accounts illustrate this to be false. As for myself reject 'Itiqadat, yes I am not someone who does blind taqleed of al-Saduq alHamdulillah, rather I affirm his mistakes like in the case of this khabar narrated by the Batri Mujasimite Muqaatil ibn Sulayman, a weak narrator. Akhi Nader do you say that there was a Prophet before Nabi Muhammad(صل على وسلم) and after 'Isa(صل على وسلم)? Is not that enough proof for you? Brother if you have Al-Durur Al-Najafiyyah by Yoosuf Al-BaHraanee, he goes through this part of YaHya bin Zakariyyah coming after `Eesa bin Maryam. This is a very long so I can't paste it all, it is about 8 pages long. Also here is another hadeeth that is found in Kamaal Al-Deen that shows that it was `Eesa then Sham`oon then YaHya. Also look at this verse, YaHya got his Prophethood at a very young age. Unfortunately I only have al-Kashkul and Hada'iq al-Nadhira of Shaykh al-Bahrani (AR) at my disposal. However, one must bare in mind that al-Bahrani was one prone to accept ahadith very very easily, being a light moderate Akhbari with certain Usuli tendencies. 'Eesa was also granted the gift of commission from his birth, yet what one finds is that reliable secular history such as Josephus records that Nabi Yahya (AS) was killed long before the event of the Crucifixion which people associated with Nabi 'Eesa (AS). Therefore, unless I assume that Yahya (AS) went into a form of occultation then returned, I cannot accept the riwayah. Plus I reject Muqaatil the Batri anyway, so I am being quite consistent. Yes, no dobut Al-BaHraanee was an akhbaaree, a moderate one at that. But he answers all the questions and narrates every single hadeeth for and against this khabar, if you get a chance you should look at that book. Out of this hadeeth he highlights this portion, which one came first `Eesa or YaHya. ^^ This quote wasn't talking the hadeeth that is posted, but was talking about what would come later. I got confused because if Al-Sadooq talks after a narration it is in regards to the previous hadeeth, and NOT of the hadeeth to come. I am sorry for that mistake. May Allaah (SWT) forgive me. Salaam Nader, by quoting that verse, you have just proved that this narration cannot be fully correct. Brother think about these verses. 1) Zakariyya took care of Maryam when she was young and asked Allah سبحانه وتعلى to give him a son while he was raising her. Not to mention the sequencing issue, because Allah(swt) talks about Yahya before 'Isa in both Surah Ale 'Emran and Surah alBaqarah. Do you believe that Iliyaas came after `Eessa? LooT (AS) was at the time of Ibraaheem (AS), while Yoonus (AS) was WAY after Ibraaheem (AS) which makes LooT (AS) come before Yoonus (AS), but you see this verse puts LooT (AS) after Yoonus (AS). Also, Moosa (AS) and Haaroon (AS) were before Daawood (AS) and Sulaymaan (AS), but in the verse they are said after. This alone should show that the Qur'aan doesn't put the Prophets (AS) in any order. I'm surprised you have cited this. In fact in my partial translation of Saduq's father's book, al-Imama wa 't-Tabsira, I have purposely left out this narration (which occurs around the beginning). There is the noted possible anachronism about the list of names, the deviancy of Muqatil b. Sulayman who is noted not only for his tajsimi beliefs but also his reliance on the reports of Jews and Christians, but also something you seem not to have noticed which is the impossibility of al-Hasan b. Mahbub having narrated from Muqatil. al-Hasan b. Mahbub died in 224, age 57, meaning he'd have been born around 167 hijri. However, Muqatil died in 150. So it would not be possible based on this for him to have heard it from him. After reading a littl more on the date of Muqaatil bin Sulaymaan, it seems as he did die in the year 150 AH. And yes, it is known that Al-Hasan bin MaHboob died in the year 224 AH. Where did you get that he died at the age of 57? I thought he died 75 years old. Even him dying at the age of 75, him being 1 years old when Muqaatil died is an issue. But since I reject the hadeeth of Al-Hasan bin MaHboob narrating directly from Aboo Hamzah Al-Thumaalee, and I call that mursal. Since both Aboo Hamzah Al-Thumaalee and Muqaatil bin Sulaymaan both died around the same time, this would make this hadeeth da`eef due to it being mursal. Where did you get that Al-MaHboob lived for 57 years? Here are the sources that say that Al-Hasan bin MaHboob died in the year 224 at the age of 75. مات سنة أربع و عشرين و مائتين عن خمس و سبعين سنة. So by that, it seems as there needs to be people in between Muqaatil and Al-Hasan bin MaHboob, thus making this hadeeth da`eef because of mursal. Thank you for that Mac! I have made a post correcting my error. Ah, I think I must have just read the numbers wrong (reversed them). Like you said though, even at 1 year old it's just too young to be a credible route of transmission by itself. Yeah, it is a problematic chain. Salam alaikum wa rahmatullahi wa barakatuhu. I am curious to know what the Shia say of Khidr, alaihi asalaam. Is he considered to be a prophet by your scholars, and do your folk have narrations regarding his being one of the sons of Adam (Ibn Adam) alahi salam, and if so which one? Khidr (AS) is not considered a prophet but a scholar in Islam. There is nothing in the Qur'aan to suggest he (AS) is a prophet, plus, in our hadeeth it explicitly states he is a scholar.